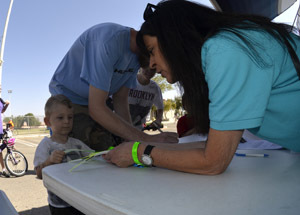 Two volunteer opportunities exist with the La Quinta Police Department. Office and clerical volunteers staff the Civic Center Policing Office in the City of La Quinta and provide administrative support to the Department. The second volunteer opportunity is the Citizens on Patrol (COP) program where volunteers patrol the city to aid in crime prevention by being the "eyes and ears" for the community. Office and clerical volunteers' primary responsibility is to staff the Civic Center Policing Office in the City of La Quinta. They assist citizens with questions in all areas from directions to situations which need the attention of a deputy. They prepare Lost or Found property reports, assist with counter reports, and take requests for extra patrols. Other activities include the bicycle registration program, "Operation Identification", and the "ChildSafe" program. They also perform various clerical functions in support of the volunteer coordinator and program sergeant. 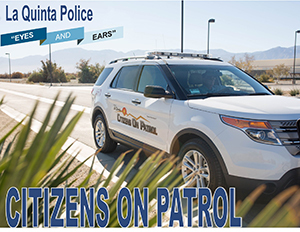 COP volunteers are extensively trained citizens that patrol the City of La Quinta in a specially marked vehicle and are a highly visible presence in the community. Their primary role is to be the "eyes and ears" for the community as they assist and support the deputies of the La Quinta Police Department. Their responsibilities include conducting extra patrols, issuance of courtesy warnings, providing crime prevention and safety information, conducting business checks, assisting stranded motorists, traffic control at accidents, maintain crime scene perimeters and other duties as directed by patrol officers. These volunteers must be knowledgeable of the police radio codes and physically capable to be in the outside environment for a moderate period of time.